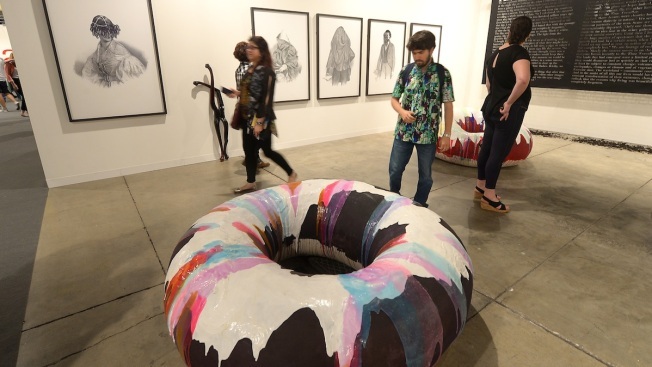 The City of Miami Beach, in conjunction with the City of Miami and Miami-Dade County Transit, will be providing trolley services between Midtown Miami and the Miami Beach Convention Center for the 2015 Miami Beach Art Week and Art Basel event. There will be two routes, an east-west route that will connect the City of Miami with the City of Miami Beach via the Julia Tuttle Causeway, and a north-south route that will run through South, Middle and North Beach serving populations traveling within the City of Miami Beach. There will be two stops, the 41st Street & Royal Palm Avenue stop and the Convention Center Drive and 17th Street stop, that will serve as connection/ transfer points between the two routes. Trolleys traveling between Miami and Miami Beach will arrive every 15 minutes at each stop and the trolleys traveling within Miami Beach will arrive every 30 minutes. All routes will be running Dec. 2-6 from 11 a.m. to 10 p.m. (Thursday-Saturday) and 11 a.m. to 8 p.m. (Sunday only). Note: Connection to the Fifth Street & Alton Garage from the Convention Center is provided by the South Beach Local/Route 123 - Park and Ride ($0.25 fare).